Image Size 18" x 37"
Dauntless dive bombers, flown primarily in the early 1940's, had the lowest loss ratio of any U.S. Carrier- borne aircraft in the Pacific during World War II. But they didn't all make it. 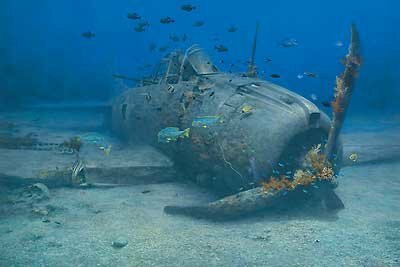 This heroic little plane, still intact, rests quietly and silenced forever, on the ocean floor.